This year, the Tour de France starts on Saturday July 7th and finishes in Paris a gruelling 21 stages later on July 29th. This year’s tour includes six mountain stages, in the Alps and the Pyrenees, a brief visit to Spain, around 20 km on cobbled roads, and both an individual and a team time trial, and takes the riders through no fewer than 36 French départements. There are 22 teams taking part, each with 8 riders. Each team has a lead rider – a Chris Froome or a Mark Cavendish, for example – with the others acting as domestiques who support them. There are four different maillots or jerseys, awarded every day of the Tour – the yellow jersey goes to the overall leader; the green jersey goes to the leading sprint cyclist, who wins the most sprint races during a stage; the polka dot jersey is awarded to the rider who has won the most climbing points throughout the hilly and mountain stages; and the white jersey, for the best youngest rider under 26. There is also a Prix de la Combativité, of a red number to be worn on the jersey, awarded to the most aggressive rider, who has attacked and caused breakaways from the peloton, or main group. 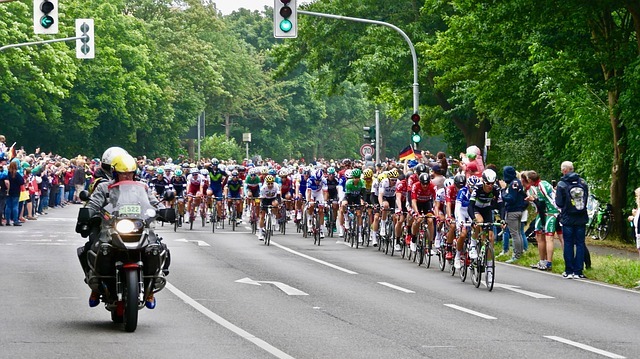 The Tour de France is the world’s largest sporting event, with around 3.5 billion TV viewers worldwide, and some fifteen million spectators lining the roadsides every year to cheer on the riders. 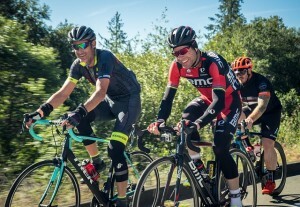 The mountains are particularly popular, as there is more chance of seeing individual riders, rather than the peloton, or main group, speeding past on a flat road. The most popular mountain climb is the Alpe d’Huez, where spectators are known to camp for days in advance to get a good spot. The atmosphere is charged by the arrival, an hour or so before the first riders, of the Caravan, a carnival-style parade held by the race sponsors, with gifts and goodies thrown out to the increasingly enthusiastic crowds. For amateurs, cycling is hugely popular in France, and safer than you might imagine, with strict laws protecting cyclists – motorists must allow one metre between their car and the cyclist while overtaking in town, one and a half elsewhere, and in the case of a collision, the motorist is considered at fault unless they can prove otherwise. Clubs are often sponsored by their mairie and local businesses, so that club kits are subsidised and relatively inexpensive. Membership is dependent on a medical certificate, and also includes insurance against any accidents. You can search for a local cycling club on this French amateur cycling website. For amateur cyclists there are plenty of races to enter, the smaller of which are known as Randonnées, the larger Cyclosportives. These are put on by the larger clubs in coordination with their local authorities. ‘My local race is the Vençoise, put on by the Vence club. By now it’s become a fully-fledged cyclosportive, with around 400 participants, including some from overseas,’ says Dave. Another hugely popular event among amateur cyclists is L’Etape du Tour, for which a mountain stage of the Tour is opened up to competitors, allowing them to ride on the same routes and climbs under the same conditions as the professionals – with roads entirely closed to traffic, the only cyclosportive to be able to do so. Now in its 28th year, the Etape is hugely popular, attracting some 15,000 participants. This year’s event is the Tour’s tenth stage, from Lake Annecy to the nearby resort of Le Grand-Bornand, which takes in several major climbs, panoramic views and kilometres of untarmacked road. Of course, the Tour has not been without its scandals, the most recent of which was when seven-times winner Lance Armstrong was found guilty of doping and stripped of his titles in 2012. Cheating is nothing new to the Tour, however, as back in 1904, winner Maurice Garin was disqualified when it emerged he’d actually caught a train for his victory in the Alps! He’d also won the very first Tour, in 1903, which only came into being when a sports paper called L’Auto needed to increase its sales. A member of staff, who happened to be an amateur cyclist, suggested a bike race around the country – where the only way of finding out the daily winner was to buy the paper. It was an outrageous idea, but one that took off, and although the paper itself has long since ceased to exist, its legacy, the Tour de France, goes from strength to strength.